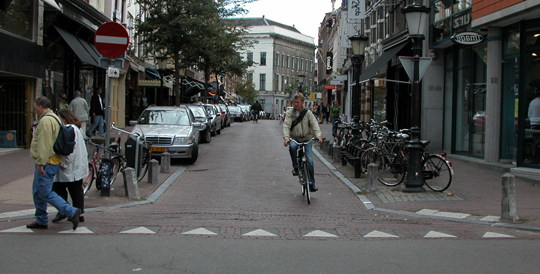 Integrated Cycling is cycling with the general traffic, with or without marked cycle lanes. Segregated Cycling is cycling on dedicated cycle tracks or cycle ways that are separated from the general traffic by a physical barrier. This section considers how the appropriate cycle facility (mixed, lane, track) on cycle links might be chosen using the Guidance Graph. 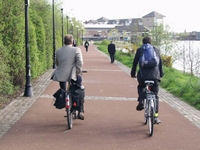 Along a cycle route, there may be different options chosen for different links. Junctions are primarily designed as integrated facilities unless there are special circumstances, e.g. specific left hand turn issues, HGV movements, etc. The three principles of sustainable safety relevant to integration are functionality, homogeneity and legibility. In an integrated environment, pedestrian and cycle movements, loading and public transport facilities etc, are prominent functions. Integrated cycling is appropriate in these cases as the through traffic function is subordinate to, equal to, or limited by, other road and street functions. Environmental and amenity objectives etc may also apply. The graph below recommends the traffic volumes and speeds at which integrated cycling is the optimal solution. The design should include controls such that the appropriate speeds and volumes are met, thereby creating an attractive and safe integrated cycling environment. It is important that the low speed environment is self-evident, self-enforcing and self-explanatory, regardless of the number of cyclists, time of day etc. Integrated cycling is generally not recommended for primary distributor roads whose function is the optimal movement of through vehicular traffic. It is recognised that integration, e.g. 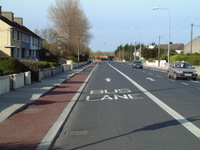 cycling in bus lanes, may feature on certain distributor roads, particularly in locations where there is no possibility of providing segregated facilities. Careful attention is required to the traffic speed, mix and turning movements in these locations. A high Quality of Service can be achieved in a well designed integrated environment. 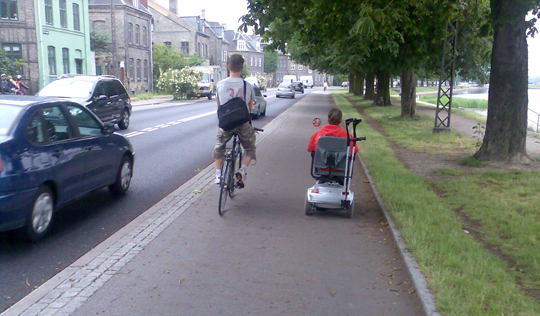 Many residential and access streets already offer a high quality of service to cycling. 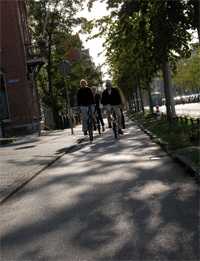 Cycling two-abreast on quiet, interesting, well-surfaced streets and roads can be attractive to cyclists. In many cases there is no physical infrastructure involved, other than the self-evident and self enforcing nature of the environment. Heavy congestion and high traffic volumes will limit Quality of Service. The three principles of sustainable safety relevant to segregation are functionality, homogeneity and legibility. 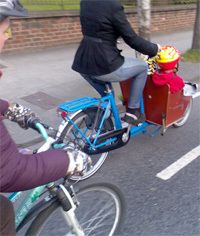 If the primary function of a road in a Sustainable Urban Traffic Plan is for motorised traffic, (e.g. urban distributor road, high volume / mass transit sustainable travel routes such as QBC and BRT) this function may be compromised or undermined through the introduction of an integrated cycling facility and, in turn, discourage users from adopting sustainable travel modes. 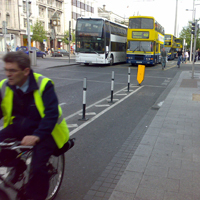 See also, Principles Underpinning Development of the Quality Bus Network and Cycling, October 2009, Department of Transport. Smarter Travel – The existence of current heavy traffic volumes does not automatically presume that cyclists should be segregated. It may be that such volumes are not in keeping with a Sustainable Urban Traffic Plan, and reductions in traffic speed and volume is required in any case. 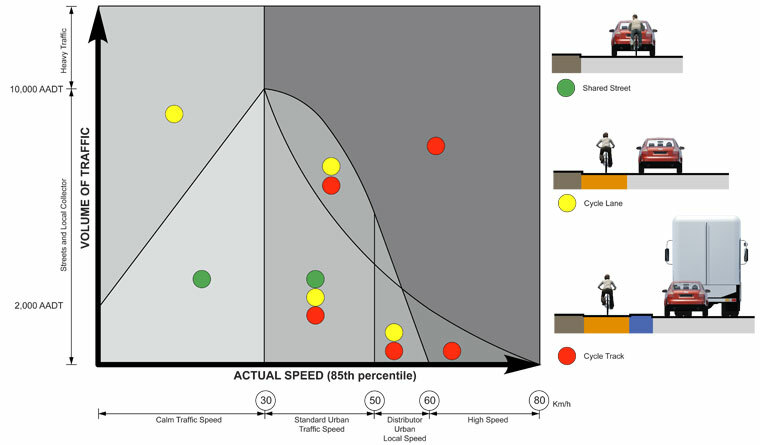 The graph below recommends the traffic volumes and speeds at which segregated cycling is the optimal solution. Maintenance: It is imperative that segregated facilities are kept free of debris and litter, and have robust, high quality surfaces. Minor junctions (access streets, entrances etc. ): It is important that traffic turning across off road segregated facilities is made fully aware of the possibility of cyclists on the facility, have adequate sight lines, and turn at an appropriate slow speed. Road Works: If cycle track is closed due to road works, a segregated alternative should be considered. 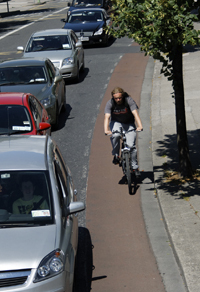 Irish transport policy seeks to reduce private car dependence from 65% to 45% for commuting by 2020. It is essential that designers actively consider reducing traffic speed and volumes for all new traffic management schemes. When determining the appropriate cycle facility required, consider the possibility of providing for cyclists in a mixed traffic environment first. 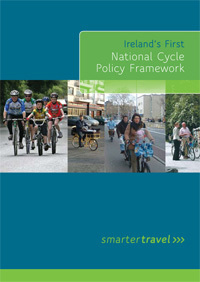 The National Cycle Policy Framework, Department of Transport, summarises this approach. This approach requires the cycle designer to fundamentally (re)assess the degree to which the existing traffic is a ‘given’. While it is acknowledged that solutions at the upper tiers of the hierarchy will not always be viable, under no circumstances should designers dismiss them out of hand at the outset. What opportunities exist to reduce the volume and speed of motorised traffic, reduce the impact of traffic on the road / street, and provide an attractive quiet environment suitable for cycling? Are traffic queues occurring or anticipated approaching junctions, even after addressing the overall traffic impacts, and how are cyclists offered priority past the queue? Is the target Quality of Service achievable without segregation? What is the maximum actual traffic speed? Inter-peak and off-peak traffic speeds are often higher. Determine the design speeds and volumes of traffic according to the regional and/ or local sustainable traffic plan, and provide the appropriate cycling facility for that regime. It behoves the designer to ensure that the Principles of Sustainable Safety, especially, Functionality, Homogeneity and Legibility, are applied to each design, regardless of the solution(s) offered in this graphic. Traffic lane widths are an important consideration. 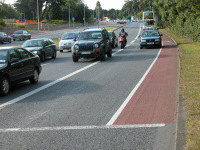 With the exception of primary distributor roads, traffic lane widths should not exceed 3m in general. (see Traffic Management Guidelines, Table 9.2: “Typical Lane Widths”. ). 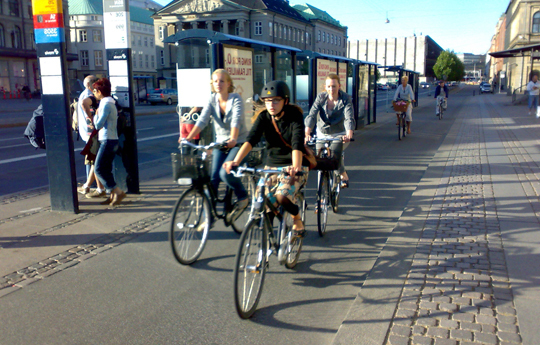 Average urban commuter cycling speeds are up to 20 km/h. Where weaving occurs, the Dutch advice (CROW) is to limit the speed differential between bicycle and traffic to 10km/h, in order that bicycles can weave in front of vehicles with relative comfort and safety etc. Beyond 50 km/h actual speed, the relative speed of vehicles to cyclist is getting high (30 km/h or higher). In relative terms, cyclists travelling at 20 km/h in a 50 km/ h zone are equivalent to pedestrians walking along the road with their backs to traffic, within a 30 km/h zone. In reviewing the graph, the threshold of 10,000 AADT is important. At 30 km/h actual traffic speed, this represents the maximum level of traffic flow at which mixed cycling is likely to be the most appropriate choice. 10,000 AADT is roughly equivalent to 1000 PCUs in the peak hour, or 666 PCUs inbound in the morning peak hour.